Weng is a 79-year-old male. During his younger days he was a heavy smoker (80 cigarettes per day). In 1995 he was diagnosed with cancer of the larynx. A total larynectomy was perfomed (to remove his larynx). 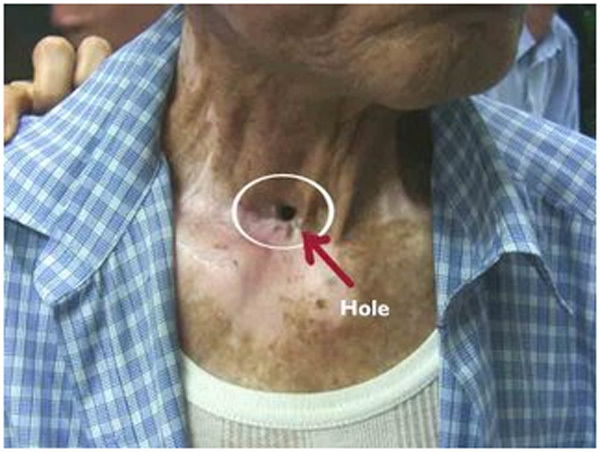 A permanent opening was created in his throat (see photo above). He produced a lot of white, sticky phlegm which had to be sucked out through this opening. After the operation Weng started to smoke again (10 cigarettes per day). A PET scan done in May 2006 indicated a 1.3 x 1 cm tumour in the upper left lobe of his lung. This was later confirmed as non-small-cell carcinoma, Stage 3. There was also a “hot spot” in the 7th rib. The doctor indicated that he has only six to eight months to live. Surgery was not indicated because the cancer had already spread to the bone. Weng was prescribed Iressa, which costs S$116 per tablet. He was asked to take one tablet per day for 20 days. As a result he suffered side effects. His fingers and skin were dry. He had diarrhea. He decided to forgo further medical treatment and came to us for help.